While in Buenos Aires I tweeted about how busy it was with so many cars, people and sounds compared to Montevideo where we were living for a month. I then got a reply from someone recommending Freddo Helados. 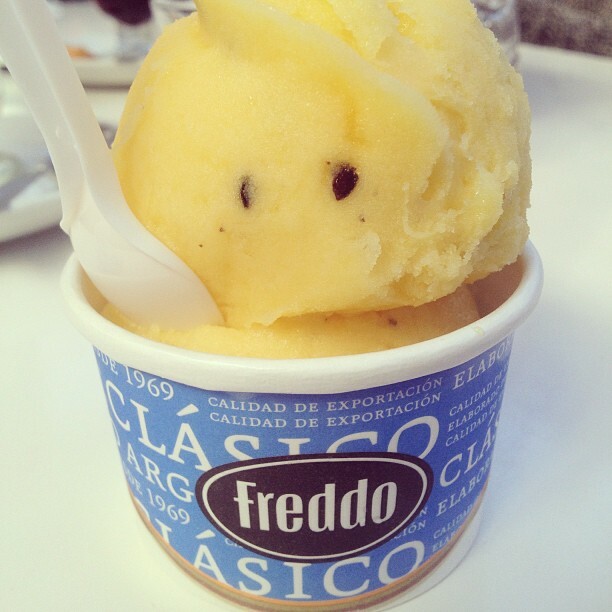 So while in Buenos Aires, I made an effort to find a Freddo Helados and try the maracuya (passion fruit) gelato. I found one in a mall among several cafes. We sat at a cafe and ordered some coffee to escape the craziness of the city for about a half hour. Meanwhile I went to Freddo and without looking at the menu asked “tiene helado de maracuya?” or “do you have passion fruit icecream?”. The man said yes and asked if I wanted a cone. I said cup and was given 2 scoops of the fruity icecream. Todos eligen Freddo means everyone chooses Freddo. I was glad that they had acknowledged my mention to them. Since we were going back to Uruguay, I wondered if they had stores in Uruguay. And received a response a day later. @bethanylooi Sí, en Punta del Este. Saludos! I believe that social media marketing influences consumers’ spending habits and when Freddo Helados took the time to reply and retweet my post, that influenced my decision that I would choose them over another icecream company the next time I get icecream in Argentina or Uruguay.